There are two very distinct sides to the Rolex lineup: the Rolex dress watches and the Rolex sports watches. Whereas by nature, dress watches are designed to look great, but Rolex sports watches are designed to look great and to serve a specific purpose. In fact, all Rolex sports watches began as a purpose-built tool for a specific audience. Rolex even specifically labels them as Professional Series watches, although they’re more commonly referred to as Rolex sports watches by non-industry folk. Although many of these timepieces are not actually used to their full potential today but rather, worn more for their style, the origins and functionality of Rolex sports watches still evoke plenty of admiration and respect among watch fans worldwide. Let’s take a closer look at some iconic Rolex sports watches and highlight their beginnings, evolutions, and current standings. By today’s standards, the Explorer may not be the first watch you think about when considering a Rolex sports watch. But this model was, in actuality, the one that started it all. In 1953, Sir Edmund Hillary and Tenzing Norgay made it to the top of Mount Everest. Also, there were some Rolex Oyster watches along for the ride. Later that year, Rolex introduced the Explorer watch not only as a tribute to that historic climb but also as a tool watch for the adventure-set. With its robust stainless steel construction, waterproof case, and clutter-free luminescent dial, the Explorer was built to withstand harsh conditions. Thus, it was ideal for adventure seekers. Today, the 39mm stainless steel Explorer is the most understated and affordable Rolex sports watch available. Also in 1953, Rolex launched what would later become their most famous sports watch ever—the Submariner. Instead of tops of mountains, this time Rolex constructed a watch for divers to use while venturing deep under water. In addition to being the first diving watch water resistant to 330 feet, the Submariner also came equipped with a rotating bezel to keep track of immersion times. The inaugural 36.5mm stainless steel Submariner has come a long way over the last six decades. There have been size increases, design enhancements, and improved water resistance and functionality. Today, the Submariner measures 40mm, is water resistant to 1,000 feet, and includes a unidirectional bezel for better safety. Plus, the Submariner is available in a range of materials—steel, gold, and two-tone steel and gold—and colors, and comes with or without the date function. Riding the jet age boom, Rolex literally reached for the sky with the introduction of the GMT-Master in 1955. At the request of Pan Am airlines, Rolex developed the GMT-Master watch, whose main function was to indicate two time zones simultaneously. With its center hands, extra 24-hour hand, and rotating bicolor bezel marked to 24 hours, the GMT-Master watch allowed pilots to read their local time as well as their home time. Eventually, Rolex unveiled the GMT-Master II model, which permitted the tracking of three time zones since the 24-hour hand was made to be set independently from the main hour hand. It’s important to note that many GMT-Master I and GMT-Master II models sport a distinct two-color bezel. For instance, there’s the red and blue Pepsi bezel, the black and red Coke bezel, and the brown and beige Root Beer bezel. Today, the 40mm GMT-Master II Rolex sports watch is the quintessentially luxury watch for world travelers, offered in a slew of metals and bezel options. In 1963, Rolex revealed their sportiest watch to date with the Cosmograph. Given its ability to time events via the stopwatch function, the then-new Rolex chronograph was created with motorsports in mind. So to underline that connection with automobile racing, Rolex quickly added the “Daytona” name to the collection—the city widely considered as the capital of car competitions. Over the course of its history, the Daytona went from a 37mm manual-wind chronograph in the 60s, 70s, and 80s, to a 40mm automatic modified Zenith-movement chronograph in the late 80s and 90s, to finally, an entirely in-house built automatic chronograph from 2000 onwards. Similar to the Submariner and GMT-Master II, the Daytona is offered in an assortment of metals, colors, and styles. From stainless steel models to full gold versions to two-tone editions to platinum examples, there’s a Daytona to suit almost anyone’s taste. Today, vintage, discontinued, and current Daytona chronograph watches are some of the most coveted sports watches in the market. In the 1960s, the French commercial diving company, COMEX, was in need of an even more capable tool watch to accompany their commercial divers. So Rolex obliged and presented the Sea-Dweller in 1967 with water resistance to 2,000 feet. In addition to the increased water resistance, the Sea-Dweller also came equipped with the Helium Escape Valve. The HEV allowed for the automatic release of built up gasses from the watch that occurred during diver decompression times in specialized chambers, thus preventing damage to the timepiece. The Sea-Dweller underwent several modifications over the years including better water resistance, newer calibers, and sapphire crystal. However, Rolex did discontinue the 40mm Sea-Dweller for a short time in 2008 to make way for the larger Deepsea model. However, the brand brought back the SD in 2014 with a new Cerachrom ceramic bezel. Finally, in 2017, Rolex released a new 43mm Sea-Dweller sporting, for the first time, a Cyclops lens over the date window. In 1971, Rolex decided to take the Explorer watch legacy even further by creating the Explorer II watch. Specifically built for extreme adventurers such as spelunkers and polar explorers, the stainless steel Explorer II featured a 40mm case, a highly luminescent dial with a date window, a fixed bezel marked to 24-hours, and an extra 24-hour arrow-tipped orange hand. The combination of the extra hand and bezel permitted wearers to differentiate between day and night hours even when clouded in darkness for long periods of time. While the Explorer II remained as a 40mm steel sports watch, in the 1980s, 1990s and early 2000s, its look changed to include round lume plots, Mercedes style hands, and a red 24-hour hand that could now indicate a second time zone since it was independent of the main hour hand. In 2011, Rolex unleashed a larger 42mm version of the Explorer II, along with the revival of the famous orange hand. In the early nineties, Rolex announced a brand new collection inspired by a nautical lifestyle, dubbed the Yacht-Master. To emphasize the luxuriousness of this then-new Rolex sports watch, the inaugural Yacht-Master was a full yellow gold model with a 40mm Oyster case and matching Oyster bracelet. A couple of years later, Rolex offered a 35mm midsize version and a 29mm ladies’ version. During its short 25-year history, the Yacht-Master has become one of the company’s most versatile sports watch collections with a wide assortment of models. In addition to size variations, there are plenty of material choices too. There are Rolesium models that combine steel and platinum, two-tone models that combine either yellow or rose gold with steel, and Everose gold models with the innovative Oysterflex black rubber bracelet. While the Yacht-Master is a casual chic Rolex sports watch, the Yacht-Master II was made with the competitive sailor in mind. Making its debut in 2007, at the heart of the Yacht-Master II is a regatta chronograph with the world’s first programmable countdown with a mechanical memory. Furthermore, the countdown is cleverly operated via the bezel, also known as the Ring Command Bezel. 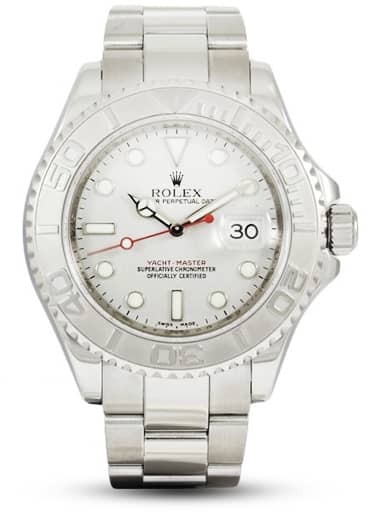 The 44mm Yacht-Master is one of the larger Rolex sports watches available in a variety of metals. Depending on your preference, there are steel, two-tone steel and Everose gold, white gold and platinum, and full yellow gold models to choose from. A relatively new model, Rolex released the Deepsea in 2008 to replace the Sea-Dweller. As the most extreme Rolex diving watch available, the steel Deepsea measures a very robust 44mm. Its Oyster case is resistant to an incredible 12,800 feet thanks to the Ringlock system featuring a nitrogen-alloyed steel central ring, a 5mm‑thick domed sapphire crystal, and a titanium caseback. While the inaugural Deepsea includes the signature black dial, in 2014 Rolex launched a special D-Blue dial to commemorate James Cameron’s historic dive in the Deepsea Challenger submersible to the earth’s deepest point. The D-Blue dial gradients from blue to black to represent the darkness of the deep, while the “DEEPSEA” label features the same green color as the submersible. Whether you’re into diving, flying, mountaineering, sailing, or cave exploring, there are Rolex sports watches to accompany you on your adventures. Whichever Rolex sports watch you decide on, they all boast incredible history, impressive longevity, fantastic practicality, and to top it all off, enviable looks too!